Instructables user [Roboro] had a Mad Catz Xbox steering wheel controller he hasn’t had much use for of late, so he decided to hack and use it as a controller for a robot instead. Conceivably, you could use any RC car, but [Roboro] is reusing one he used for a robot sumo competition a few years back. Cracking open the controller revealed a warren of wires that were — surprise, surprise — grouped and labelled, making for a far less painful hacking process. Of course, [Roboro] is only using the Xbox button for power, the player-two LED to show the connection status, the wheel, and the pedals, but knowing which wires are which might come in handy later. An Arduino Uno in the wheel and a Nano in the robot are connected via CC41-A Bluetooth modules which — despite having less functionality than the HM10 module they’re cloned from — perform admirably. A bit of code and integration of a SN754410 H-bridge motor driver — the Arduino doesn’t supply enough current to [Roboro]’s robot’s motors — and the little robot’s ready for its test drive. Many of us have had a radio controlled car at some time in our youth, though it’s probable that none all of us entirely mastered it. There are memories of spectacular crashes, and if we were really unlucky, further boosts to Mr. Tamiya’s bank balance as fresh parts had to be fitted. [Paul Yan] was watching his young son with a radio controlled toy, and was struck by how the two-joystick control layout is not necessarily as intuitive as it could be. By contrast when faced with a console game with first-person view and a steering wheel the boy had no problem dropping straight into play. This observation led him to investigate bringing a console steering wheel to an RC car, and the result is a rather impressive FPV immersive driving experience. His build took a PS2 steering wheel peripheral with pedals and mated it to an Arduino Uno via a PS2 shield. 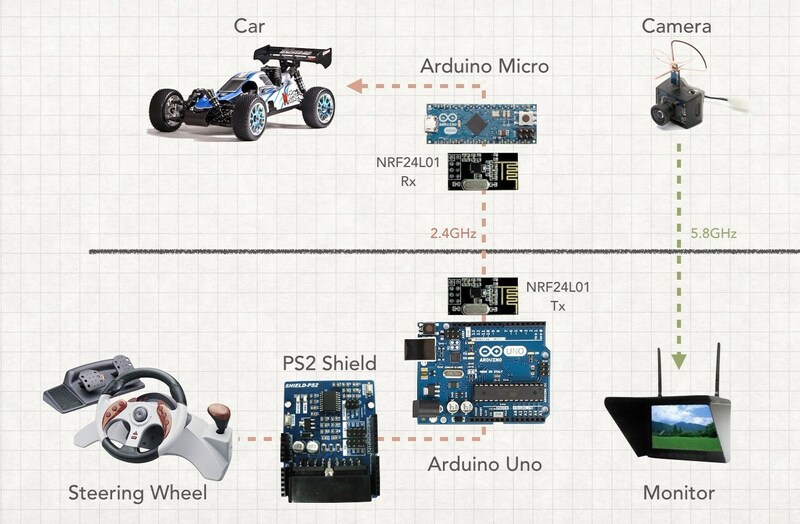 The Uno talks to a Nordic NRF24L01 RF module, which communicates with another NRF24L01 on the car. This in turn talks to a car-mounted Arduino Micro, which controls the car servos and speed controller. FPV video is provided by a miniature camera and transmitter from the world of multirotor flying which is mounted on the car and transmits its pictures over 5GHz to a set of monitor goggles. Sadly he does not appear to have posted any of the software involved, though we doubt there is anything too challenging should you wish to try it for yourselves. The video below shows the car in action, complete with an over-enthusiastic acceleration and crash from his young son. He tells us it’s a similar experience to playing a racing kart game in the real world, and having seen the video we wish we could have a go. [Rulof] never ceases to impress us with what he comes up with and how he hacks it together. Seriously, how did he even know that the obscure umbrella part he used in this project existed, let alone thought of it when the time came to make a magnet mount? His hack this time is a real world, tabletop race track made for his little brother, and by his account, his brother is going crazy for it. His race track is on a rotating table and consists of the following collection of parts: a motor, bicycle wheel, casters from a travel bag, rubber bands (where did he get such large ones? ), toy car and steering wheel from his brother, skateboard wheels, the aforementioned umbrella part and hard drive magnets. In the video below we like how he paints the track surface by holding his paint brush fixed in place and letting the track rotate under it. From the video you can see the race track has got [Rulof] hooked. Hopefully he lets his brother have ample turns too, but we’re not too sure. Some additions we can imagine would be robotics for the obstacles, lighting, sounds and a few simulated explosion effects (puffs of flour?). What a strange message to read on the digital dashboard display of your car. This is proof that [Kristoffer Smith] was able to control the ODB-II bus on his Eagle Grand Cherokee. He’s not just doing this for the heck of it. It stems from his goal of adding an Android tablet on the dashboard which has been a popular hack as of late. This left [Kristoffer] with steering wheel controls that did nothing. They originally operated the radio, so he set out to make them control the tablet. He had seen an Arduino used to control the CAN bus, but decided to go a different route. He grabbed a USB CAN bus interface for around $25. The first order of business was to use it with his computer to sniff the data available. From there he was able to decode the traffic and figure out the commands he needed to monitor. The last piece of the puzzle was to write his own Android code to watch for and react to the steering wheel buttons. You can check out the code at his repository and see the demo after the break. [Pseudolobster’s] company was putting together point-of-sale machines for a retailer. They had surplus computers which really brought the price down but ran into a snag when adding the second monitor. The boxes wouldn’t play nicely with PCIe 16x. His solution was to scotch tape pins 19-82 on the cards, effectively turning them into PCIe 1x… and it worked! No link here but we wanted to share the trick anyway. [Simon Inns] shows how to add a character display to a PC case. We’ve seen him work with these PIC 18F2550 controllers several times before but we like how nicely this piggy-backs the display board seen in green. [Graham] bought a new stereo for his Peugeot 406. Unfortunately, the built in radio controls in his steering wheel didn’t interface directly with the head unit, but rather with the vehicle itself. His solution was to build a device to decode the button presses and send them to the head unit in the appropriate fashion. All source code and schematics are available on his site. He states that this should work on any PSA/Renault vehicle with a 125Kb VAN bus. We’re curious how similar some of the American systems are. We have seen something similar where someone wanted to control their Zune from the steering wheel.